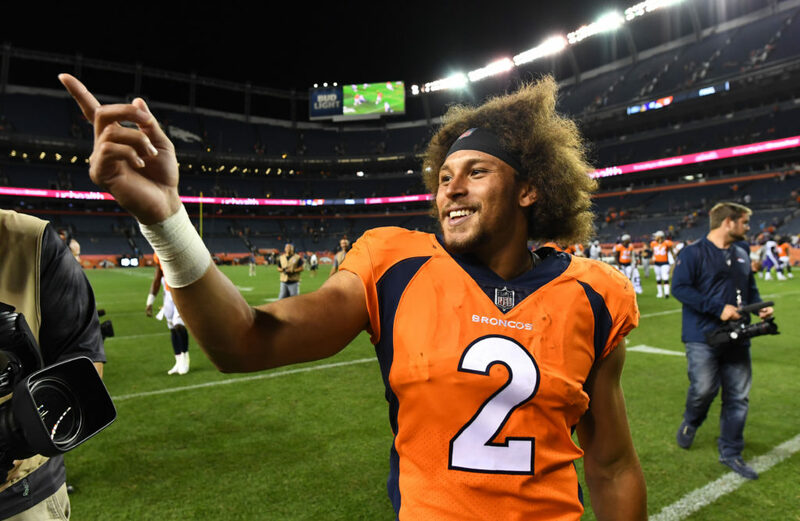 Phillip Lindsay is no longer just a feel-good story. Yes, Lindsay went undrafted this past year, but that does not mean that his inclusion in training camp with the Denver Broncos was just an ‘atta boy’ for the former University of Colorado running back. Lindsay is showing not just that he can stay above water in a NFL setting, but more so that he belongs in the NFL and is making it nearly impossible for the Broncos to leave him off of their 53-man roster. His teammates know it, his coaches know it, and Lindsay knows it. Lindsay is impressing every set of eyes that catch a glimpse of his ability on a football field. Even offensive coordinator Bill Musgrave — usually a soft-spoken individual — vocalized praise for Lindsay after working him into the offensive systems more and more as the days of training camp continued to grow and accumulate. At this point in Lindsay’s very short NFL career, it is nearly impossible to find someone who has anything bad to say about him. Lindsay is a hard working and multi-faceted running back who will do anything he can to help his team win. It does not matter if that means catching passes out of the backfield, operating as the primary runner during preseason games, or going out on special teams and making plays. While that is all good and dandy, there are a lot of fringe NFL players who bring those intangibles to the table with them but still fail to secure careers in the National Football League. Instead of hoping for the best, Lindsay is letting his on-field production speak for itself. According to Pro Football Focus, there has not been a better and more productive running back for the Broncos throughout the preseason. In every category other than pass blocking — Lindsay has not been asked to pass block in a game setting at this point — Lindsay grades out as the best running back that has played in the preseason so far for the Broncos. Sure, Lindsay has played against worse competition being that he is lower on the depth chart, but the point of this is to show that when Lindsay steps onto the football field, good things happen. For perspective, here is the same grading system from Pro Football Focus, but instead of showing just Lindsay’s output, here is the rest of the running backs as well. Lindsay has clearly been the best runner and receiver out of the backfield for Denver. At this point, there is no reason to keep Lindsay off of the Broncos final 53-man roster. He is too helpful of a football player in so many different ways to make him just a practice squad body. While the final roster has not yet been released, Lindsay is making his case to become a full-time contributor for the Broncos, and when his play isn’t speaking for itself, his teammates are speaking up for him. There is not much else Lindsay can do to prove his worth. As long as he keeps this level of play sustained for the rest of the preseason, Lindsay will be a permanent member of the Broncos from day one of the regular season and he deserves every sliver of credit for working his way into this position.